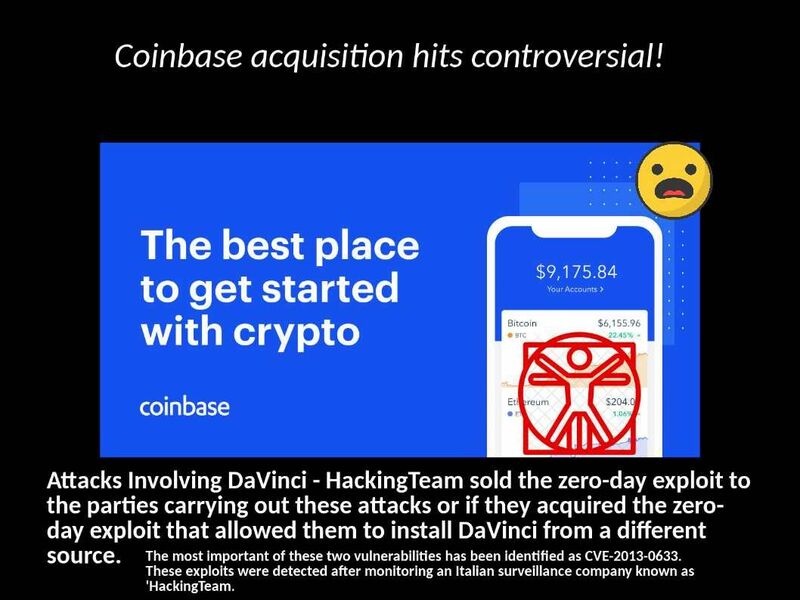 Preface: Coinbase announced that it had acquired Neutrino, a blockchain intelligence startup on Feb 2019. This acquisition aim to analyzing data on public blockchains, Neutrino will help us prevent theft of funds from peoples’ accounts, investigate ransomware attacks, and identify bad actors. Market status: A tremendous worries by cryptocurrency users because the Neutrino (acquired company) run by Former Spyware Developers. And the Neutrinos key staff have been involved with Hacking Team. Recalling memories: Do you still remember Italian surveillance company exploit CVE-2013-0633. The attacks Involving DaVinci. 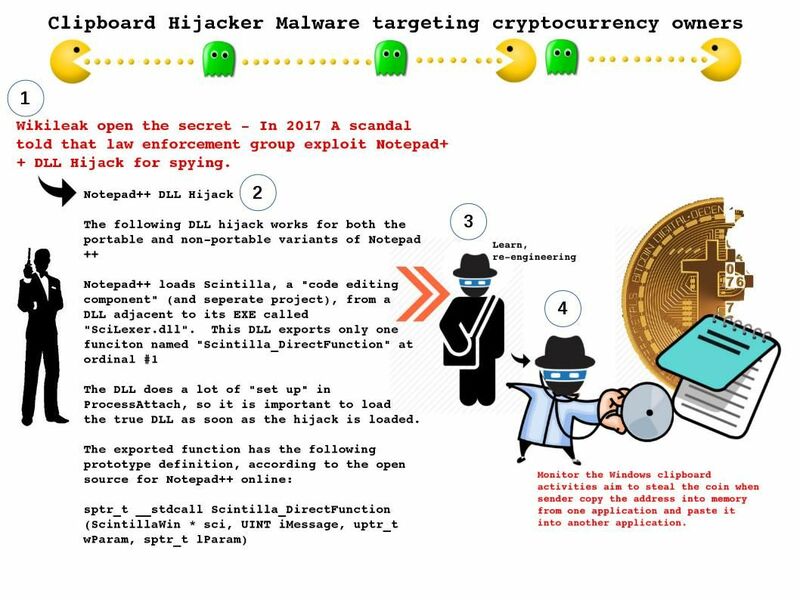 HackingTeam sold the zero-day exploit to the parties carrying out these attacks or if they acquired the zero-day exploit that allowed them to install DaVinci from a different source. Hacking team responsible the above action. Do we really need cryptocurrency or bitcoin? Preface: A new survey out of China shows surging interest in the bitcoin and cryptocurrency, with many keen to invest in crypto in the future – said Forbes News. Synopsis: The behaviour of human relies on banknotes perhaps will be replaced by another style of method substitution soon. It is hard to say that bitcoin is the substitution. But the new generation of technologies can tell. Retrospectively at the decades after the Second World War. The industrial civilization on Earth driven economic growth. Whereby it create a motivation power to payment industry. For instance Telex and SWIFT payment system. As a matter of fact, we have to admit that electronic payment become a the trend in future. As a matter of fact cryptocurrency or blockchain technology is on the way integrate to modern business world. 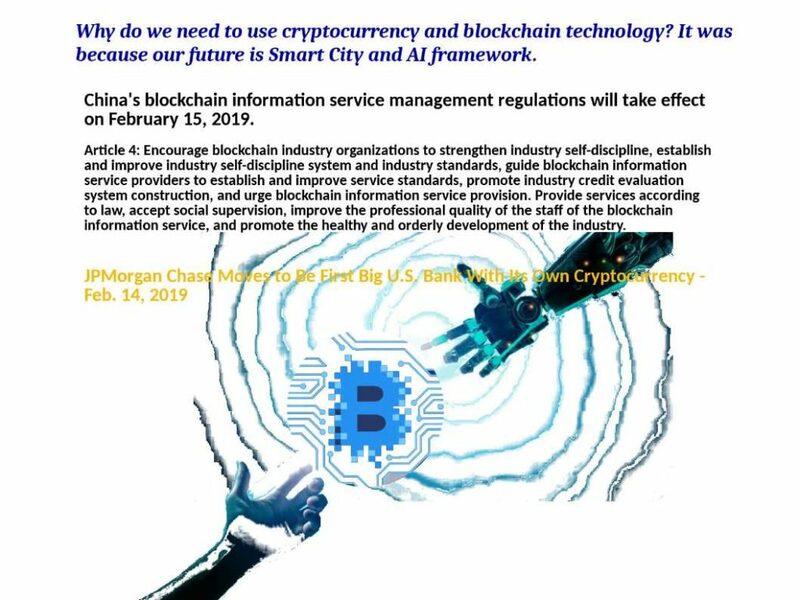 Prediction: On Feb 2019, JPMorgan became the first major United States bank to introduce its own digital token for real-world use (see below url). Besides, the initiatives of smart city construction around the world. And believe that old fashion of payment concept and architecture should be replaced! An Integer Overflow is the condition that occurs when the result of an arithmetic operation, such as multiplication or addition, exceeds the maximum size of the integer type used to store it. 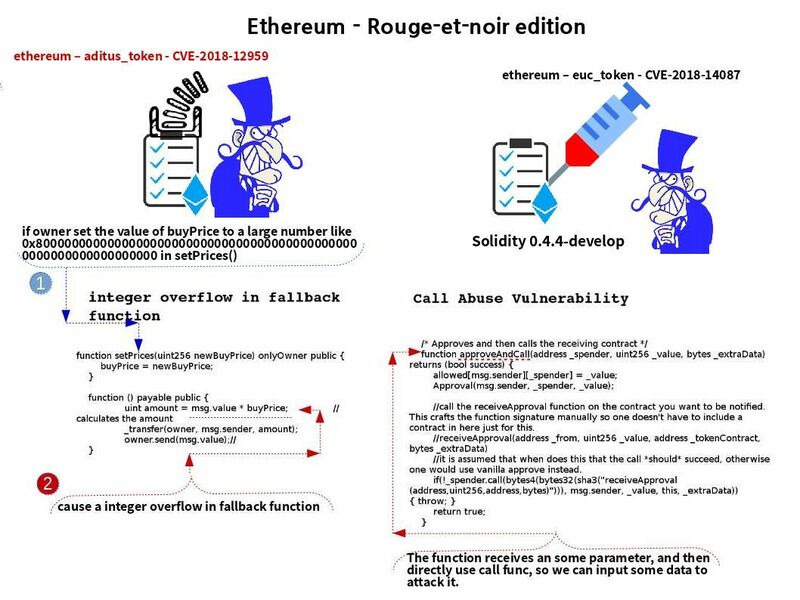 Ethereum hits such vulnerability in frequent. 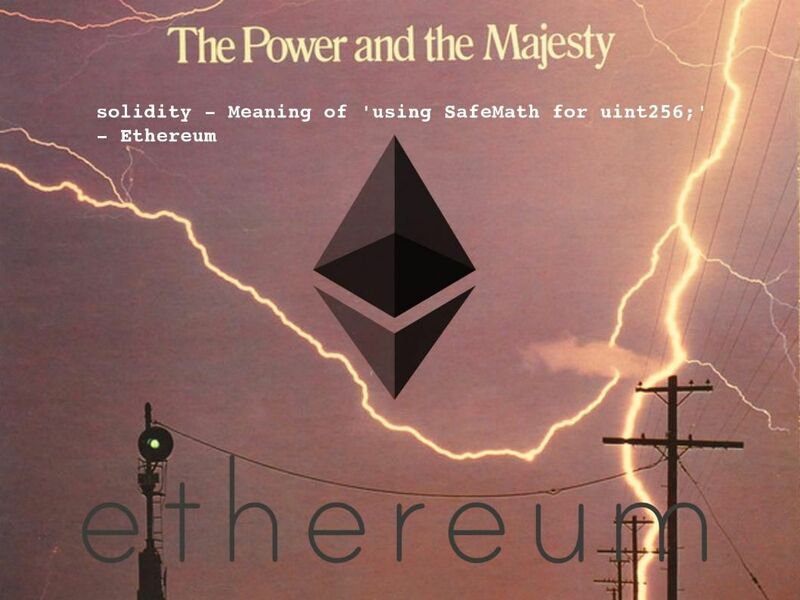 The solidity programming language rescue Ethererum in the cryptocurrency world. But no prefect things in the world. A vulnerability found on Ethereum EUC token recently. The EUC token build by solidity programming language. The guru given his nick name “call abused” vulnerability. For details, please see below hyperlink for references. Integer overflow weakness similar kill the Ethereum. But SafeMath to protect from overflows. 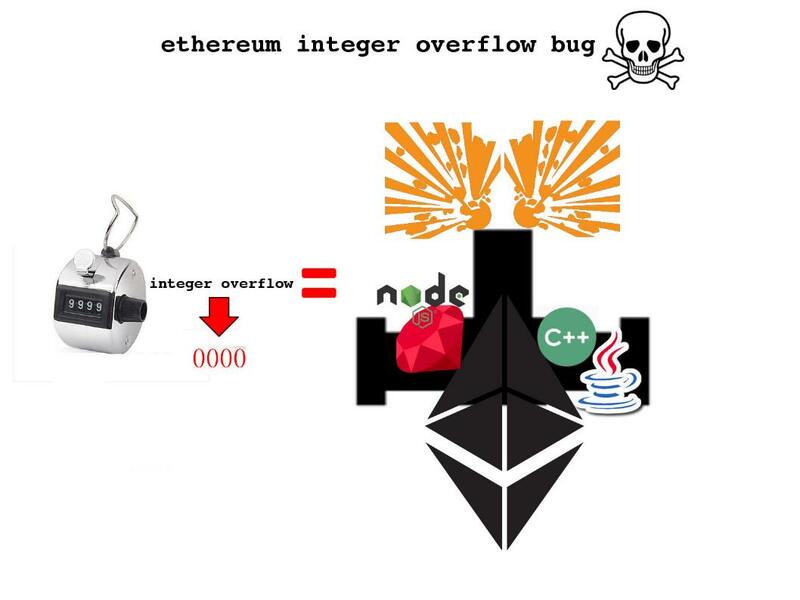 Jul 2018 – Integer overflow may killed Ethereum! But SafeMath to protect from overflows. write an algebraic expression in a certain order. We start with the terms that have the largest exponents and work our way down to the constants. Using the commutative property of addition, we can rearrange the terms and put this expression in correct order, like this. How does the SafeMath library of OpenZeppelin protect your code from integer overflow? The existing market cap of Ether (ETH) is more than Ripple and Litecoin, although it’s far behind Bitcoin (BTC). Ethereum contains potential market power. But integer overflow is the enemy of Ethereum. It is possible to scare the investor when related incident occurs. What is the modulus in math? Notice that the numbers on the clock go up to twelve, and then they start over. In mathematics, this circular counting is called modular arithmetic, and the number 12 in this example is called a modulus. Above theory bring an idea that when modulus reach limit then it will reset to zero. For instance, the owner of the smartcontract could set sellPrice and buyPrice using setPrices() function. For example, after some transactions, the owner could set sellPrice to 0x8000000000000000000000000000000000000000000000000000000000000000 (modulus). When some user wanted to sell 2 ETCBKs for ETHs back，amount * sellPrice equals 0. Thus the seller gave out 2 ETCBKs but none ETHs was retrieved. The contract still kept it, which makes this token unsafe. An overflow condition gives incorrect results and, particularly if the possibility has not been anticipated, can compromise a program’s reliability and security. Theoretically, the programming language contain “Safe Math” can protect integer overflow/underflow won’t happen. Below table of contents displayed the Integer overflow handling status in various programming languages. This could happen whenever you are doing arithmetic operations such as + , – , * . When using the SafeMath library, the results of this operations will be checked and an error will be thrown stopping the execution of your smart contract. With Solidity feature, you can call the public functions defined by your library. The SafeMath library to protect from inputs that could make your contract do unexpected things after overflow or underflow leading arithmetic operations. Perhaps former cryptocurrency not used Solidity library and there it is possible let attacker conduct the integer overflow attacks. Below is the most update CVE status on Jul 2018. Vault 7 re-engineering by hacker. They are aim to steal the cryptocurrency. As far as we know, Notepad++ has been updated to version 7.3.3. It aim to remediate a vulnerability on notepad. Such vulnerability exploit by law enforcement to do the survillance. The specifics annoucement released by WikiLweaks on 2017 so called Vault 7. Wanna Cry Ransomware technology re-emngineering of Microsoft SMB weakness and jepodizing the world. It wreak havoc in cyber security world in 1st quarter in 2018. Cryptocurrency technology proud of their design concept and technology and claimed that it can reduced the cyber attack in fundemental concept. The reality is that the total no of data breaches or money losts not less than traditional technology architecture. What’s the root causes let distrbuted technogy demote their cyber security in scanario today. Per observation, cryptocurrency system limitation occurs in endpoint devices in frequent. From technical point of view, the zero day of attack is hard to avoid in personal computer user end point devices( mobile phone, notebook and desktop). A hints as usual inform cryptocurrency owner stayed alert. As a matter of fact, nowadays antivirus can keep secure of your system. Please make sure your virus signature is up to date. The vulnerabilities and cyber attack looks never stop so far. Do you still remember virtual currency exchange Coincheck lost $400 million in NEM cryptocurrency in Jan 2018? The hack only involved NEM, because the security breach was caused by the lack of strong security measures of Coincheck with regards to their implementation of NEM, lacking the use of mutlisignature support or a cold wallet. It looks that criminal group will be intereted of low market value cryptocurrency. For instance, CVE-2018-10468 hacker exploits useless token combine with vulnerability steal the token. Coincheck lost $400 million in NEM but the market price of each coin is in lower value. FutureXE market price equal to zero buy still avaiable to buy on the market. I think this type of coins will be lure criminal group interest. The fact is that this type of coins willl be exploits for money laundering. 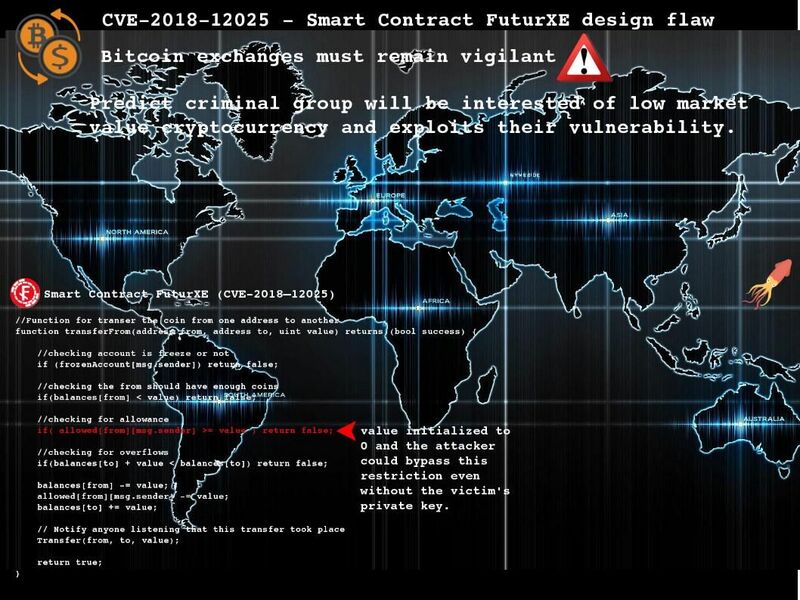 Since the coin has vulnerability occured, criminal group can hiring hacker to steal the coin and waiting for bitcoin exchanges reimburse the fund to achieve the money laundering objective. The earlier generation of blockchain technology empower encryption power let the world know his capability. As times goes by people found the design weakness of blockchain technology is the performance of synchoization of the peer nodes. Such design weakness cause double spending vulnerability. The next generation of technology so called HYPERLEDGER. It enhance the design weakness of blockchain. As a result cryptocurrency especially Ethereum relies on Hyperledger Fabric in demand. A blockchain project developed by several Japanese firms including by startup Soramitsu and IT giant Hitachu has been accepted into the Hyperledger blockchain initiative. A fix has been released by Hyperledger IROHA project two weeks ago. 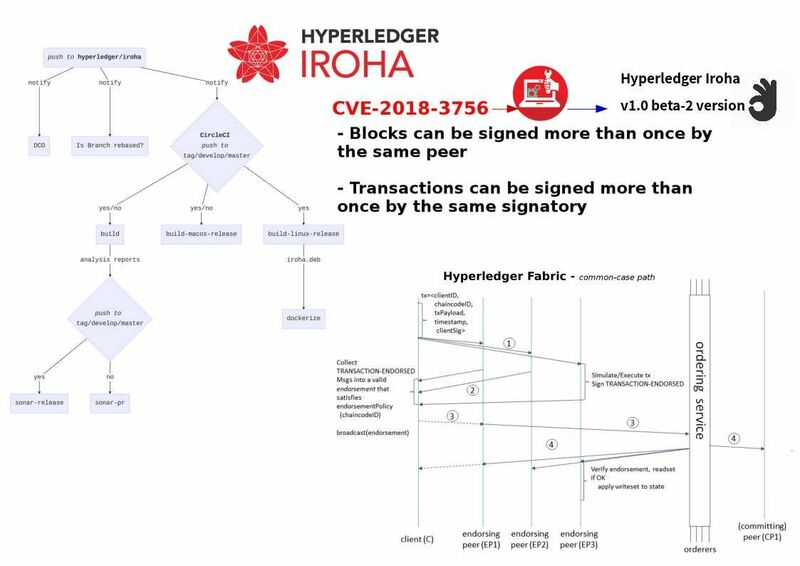 Hyperledger Iroha v1.0 beta-2 version is avaliable for download. The reason is that a critical vulnerabilities discovered during the security audit. On 2017, Cambodia central bank taps Hyperledger Iroha for blockchain settlement. Perhaps they update to beta 2 already. Have you heard a song by Dinah Washington ? The song title is what a difference a day made? In crypto currency world, bitcoin is the big brother. 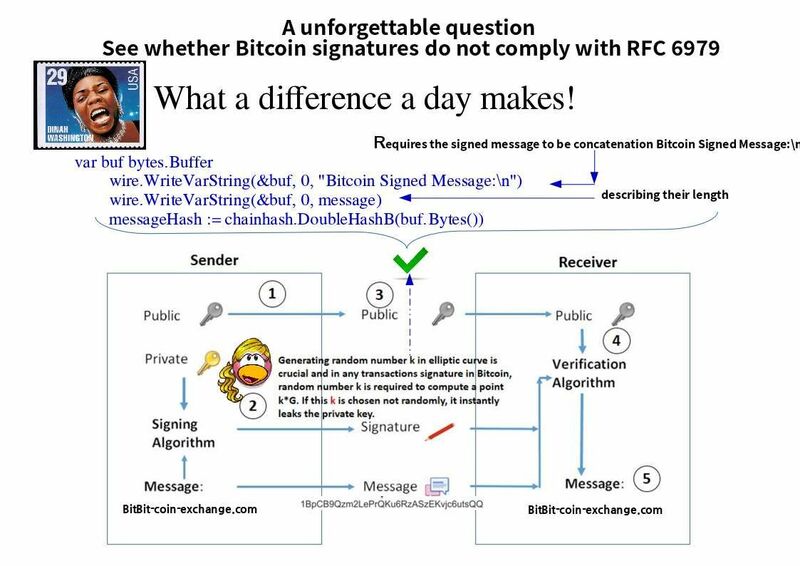 However technology world still concerns Bitcore signatures is able to comply with RFC 6979 specification? Bitcoin owner must protect the private key. The conceptal idea is that generating random number k in elliptic curve is crucial and in any transactions signature in Bitcoin, random number k is required to compute a point k*G. If this k is chosen not randomly, it instantly leaks the private key. Do you think attached diagram can provide the resolution to you in this regard? What A Diff’rence A Day Makes Lyrics: What a difference a day made? Twenty-four little hours. Brought the sun and the flowers.Where there used to be rain……..
We watch the movie, tycoon decide to keep the money in Switzerland. Whatever special of reasons. Swiss made or location provides a secure and best environment to the world. Besides, swiss army knife a symbol of permanent and reliable tool to solider. 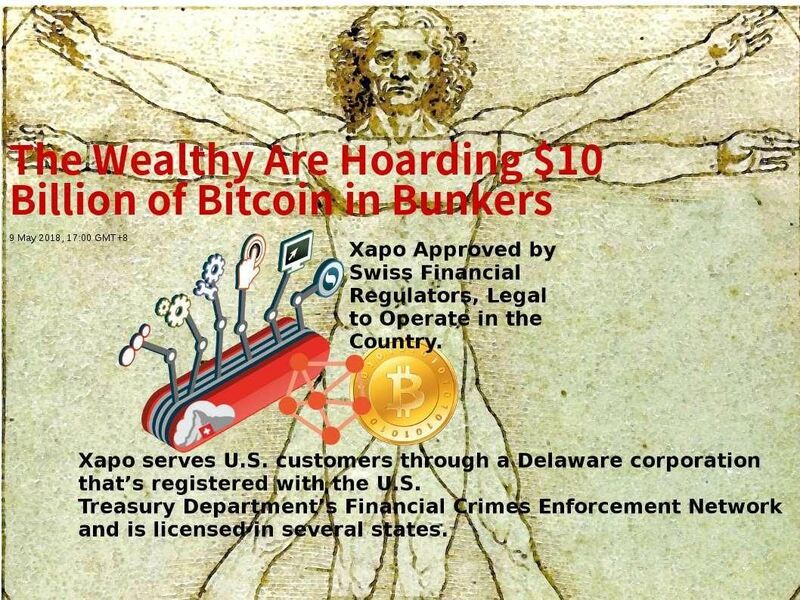 Just heard from Bloomberg headline news that the Wealthy Are Hoarding $10 Billion of Bitcoin in Bunkers. Zapo similar as a bunker, just operate for 4 years, it has more “deposits” than 98 percent of the roughly 5,670 banks in the U.S. I am interested what is the perfect way to protect your bitcoin. See whether it is a paper wallet instead of electronic. For more details, please refer below url for reference.